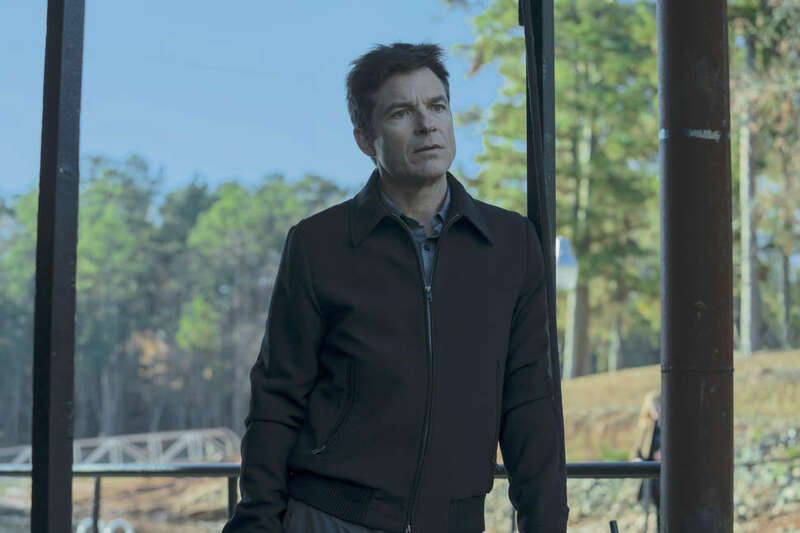 This post contains major spoilers for the first two seasons of Ozark. It was a nice try. Marty Byrde devised a brilliant plan to remove his family from Netflix's pitch-dark version of the Ozarks. One seaplane. Four fake identities. And Mullumbimby, that small town near Australia's Gold Coast that would soon be called home sweet home. But, you know, the best laid plans of mice and men, and all that jazz. While the perpetually stressed money launderer had set mostly everything in motion, he failed to foresee one final hurdle. Not the Kansas City mob or the Navarro cartel or the Langmores or the Snells, but Wendy, his loving wife, who changed her mind in the 11th hour in the name of safety. And really, drama. There's a casino boat to run and deaths -- several, actually -- to reconcile. What fun would any of that be without the Byrdes, the area's resident magnets for misfortune? You'd be right to think the Byrdes' stay in the Ozarks is just beginning. In fact, "I would put the over-under at five" seasons, head writer Chris Mundy teased. "You never want to do more [episodes] if you're running out of story, but we think five's a good length of time to tell these people's stories." Following the release of the grim crime drama's second chapter, we phoned Mundy to talk deaths, more deaths, bobcats, and beards. Thrillist: Let's get the sad stuff out of the way. A lot of characters died this season! Chris Mundy: Yeah, that was rough. As we were plotting the season out, and as we laid out what we wanted to do to Netflix at the beginning of the year, everybody knew which characters were going to go, but it's still hard because those are friends you're not going to be working with next year. Those cast phone calls were all incredibly hard to do. But to everyone's credit, everybody was really professional and gracious. The first responses were basically, "OK. Am I going to get a good death, then?" At the end of the season Laura Linney actually threw a wake for Jason Butler Harner, who plays Petty, and it was sort of a memorial to everyone who had died during the year. There were pictures and candles, a full-on funeral set-up, Laura gave a eulogy. Everybody who was around in Atlanta where we film -- most of the crew, all of us, the actors -- came. It was really nice, but sort of bittersweet, too. Poor Petty. I'm used to watching TV and thinking, "If they haven't showed us a character's body, that character might not be dead." But Petty is very, very dead. Mundy: Yeah, it's funny: For a show that's had a fair amount of violence in it, that was particularly violent. I have to say, that was harsh. How was the head smashing accomplished? Mundy: We had a really good stunt coordinator, and they did a really good job. That shot where you're kind of looking back up at Cade, and he's banging the tackle box? They put a couple towels down on the rock below, and the towels were soaked in fake blood. So when the box hit the towels, the faintest mist of blood would kick up. So he was slamming it into the rock itself, but the rock was covered in the towel. That's how we got that extra degree of grossness. Who will fill Petty's void? Mundy: I'm not 100% sure how we're going to play it. But in Season 2, Episode 9, when Petty quits and tells his supervisor he's going to leave, he lays out a pretty smart way for the FBI to attack. [Editor's Note: Petty says, "If the gaming commission votes yes, the casino has to hire 1,000 workers in a few short weeks. You can easily slip in a bunch of undercover agents, gut the cartel's money-laundering apparatus and the KC mob at the same time. This casino, it can be your Trojan Horse."] That might be a key to how they go about it. Jacob's death was also big. It's interesting to me that Darlene is taking on the mantle of Snell leader, but neither she nor her heir are Snells by blood. What's driving her? Mundy: For us, we were really interested in the parallels between the Snells and the Byrdes as couples during this season. There's no compromise in Darlene. In having the flashback to them as a younger couple, we see they were together for a long time, since they were really young. And she was sort of all-in the second they were together. And Jacob knew it. In a lot of ways, I think the drive he had was really helped by her. It always just makes sense that it was all as much hers as it was his, in a strange way. Especially because of how well Peter Mullan and Lisa Emery played them -- even going back to Season 1 -- it was always a really loving relationship. I've always thought that even now, with the heir, Darlene loves Jacob. And that heir is, in her mind, going to be a part of him, even though he's adopted. In that way, there's this a certain weird purity in it, even though it's all a little crazy and messed up. That poor kid. The casino is an inevitability. So I don't see her as being a day-to-day opponent of the casino. I see her playing the longer game going forward. In part, just on the simplest storytelling level, because I don't think we want to have her rehash everything next year that she's been doing this year. But yeah, I think she's in on the greater fight on all fronts. And we can't forget about Cade. How will his absence affect Marty, Ruth, and Wyatt? Mundy: I think for Ruth, it's going to be more complicated than she would guess. In a way, she wanted her dad dead because while she could love him, she could never really be free until he was gone. And he was never going to be gone unless he was physically dead and gone. But I think that's going to continually haunt her. Obviously, for Marty and Wendy, it's big just because Wendy crossed a line I don't think either of them thought they would cross. There's the little scene that Wendy and Helen Pierce, the cartel lawyer, have where she's basically saying to her, If you do what you're asking me to do, you're going to change forever. "Your whole body changes, the way you smell, your reflection, how you feel when your husband touches you." That's going to be a huge thing, and it's going to be part of their marriage now as well. And for Wyatt, right now, he's just completely untethered. He's sort of the purest soul in the show in a lot of ways. And I think his life would not have been in a good place had he tied in with Cade. At the same time, the one person he cared about most was Ruth, and he's probably lost that, or at least lost a version of that. So I think that the amount of confusion Wyatt's going to be in is going to be really interesting to dissect. I'm worried he's going to think Ruth killed her dad, and he won't believe her. Mundy: That's exactly right. But even that, that's a conversation that gets them talking. It's all so complicated. I just want him to go to Mizzou. Mundy: Right? Can't he just get a dorm room? But we want him around. We love the character and Charlie Tahan, who plays him. So he's got to at least stick around for a little. Which of the deaths from this season will have the most significant impact on the story going forward? Mundy: In terms of the significance, I actually think it'll be Mason's. It really was the emotional linchpin of the season for us. We talked about the season going from this place of Marty being completely able to compartmentalize everything and Wendy being much more emotional about things, to, after that death, Wendy being able to compartmentalize and Marty, suddenly, not being able to compartmentalize. So it had a huge impact on the season, but as for the way we think of the Byrdes going forward, Mason's death is also the one that's going to echo the longest. Wendy's switch was thrilling to watch. What does her future look like in the Ozarks? Mundy: Last season, we worked so hard to try to organically, over 10 episodes, bring her relationship with Marty back together -- because it started in pretty much the worst place a relationship could start. Similarly, as we were plotting her shift this season, we really wanted to make sure we laid it out right over 10 episodes. It's a tricky thing because you never know if you're going too slow, if you're going too fast, if you've earned it. But that was the biggest challenge we had. I think the key to understanding Wendy now is that her stated goal is still going to be, "Get out of the Ozarks." But is she actually being honest with herself? And is she actually happy here? Does she want to stay and establish an economic and political foothold? The key for her is she needs to start understanding herself a little bit better. Mundy: Marty, too. For us, as writers and viewers, we'll be trying to figure out if they're going to keep growing together or growing apart. I think his goal is definitely still going to be to get the family out of the Ozarks. As we delve into the marriage more next year -- to me, the show is always about the family and the marriage first -- and see that suddenly Marty's goal, which was always a shared goal, is just his, solo, well, how can he talk about that? How can he try to do it? If he and Wendy are operating kind of on the same page, but not completely, it gets trickier. At least a lot more emotionally complex. On a practical level, all these changes and deaths make room for lots of new characters. Who can we expect to meet? Mundy: Obviously, there will be the new people that we have to deal with in law enforcement, on some level, that we haven't met yet. There will be people in the inner workings of the casino that we haven't met yet. And there's any number of people who can get close to the marriage in certain ways that we'd love to bring in. I don't think we'll overwhelm people with new faces, but there's definitely going to be a few significant ones. We almost did it this year, but Wendy's brother -- who we've talked about on the show before, but haven't met -- could possibly come into the mix. We don't know yet what he does, but he's had a significant mental illness in the past. Wendy first talked about him in Season 1, when she was worried that something might be wrong with Jonah. And then again this year, when she was talking to the dead senator's wife about depression. He's just somebody who was a major force in Wendy's younger years. Again, I can't say with certainty that he'll show up next year, but I do think that in the life of the series, at some point, he definitely will. I'm excited to see more of the Kansas City mob as well. Why did they blow up Marty's office at the end of the season? Hadn't they already sent their message? Mundy: In a lot of ways, they didn't really send a message in their first ambush. They just kind of waved their finger and gave a warning. We really thought of it like, as one thing was starting, they were trying to let Marty know how quickly they could end everything else. So it was intentionally timed with the casino ceremony to make sure their first office visit wasn't a hollow threat. Last year, you told us Season 2 was going to be about the Byrdes owning their new lives. What will be the thematic direction for Season 3? Mundy: I think in a lot of ways it's that same thing, but more in tune with the marriage -- even more than the crime side of it. Seasons 1 and 2 were of one piece, and by nature of the way Season 1 ended, we had to start Season 2 right in the same moment. We have the ability to shake things up now and start a new chapter with Season 3. You can even think of seasons 3 and 4 as one piece. The good news in that is I think we can really go some place tonally different in the next year. Will that tone shift extend to the lighting and the visuals? Some viewers have been vocal about how dark and blue the show is. Is there a reason you guys have leaned into that? Mundy: Jason [Bateman], you know, directed the very first two episodes, and so that person naturally really sets the look and tone of the show. He's loved -- and we all love -- it from the beginning. The funny thing is when we shoot outside we use a ton of natural light. It's not purposely dark in the world, like when we're outside and on the lake. In fact, next year, by nature of when we film -- and I'm really happy story-wise -- the look and feel of the sky and the world will be a little bit lighter because we'll be shooting through the summer and playing summer in the Ozarks. Netflix is notoriously secretive when it comes to sharing their data with the public. Do they share anything with you? If so, does it affect how you plot the future of the show? Mundy: They don't share any of it with us. At all. They'll tell us that we did "well" or "well globally." So that's good. I'd rather hear that we're doing well than the opposite. Obviously, they've got data down to the nanosecond, but we don't see any of it. And honestly, it's kind of better. In that way, we're not reactive to anything. For better or worse, it means we just try to do the best show we can. I've never seen any [data], and I don't think Jason [Bateman] has -- we'd be the two who would. I'm sure some of that is going on in private -- they've got to decide whether to order seasons 3 and 4. But there's never been any "do this because of that" types of discussions, which I really appreciate. They're supportive, and we do our thing. In Season 1, Julia Garner required a hand double for the mouse scenes. What was the surprise stressor behind the scenes this season? Mundy: Poor Marc Menchaca, who plays Russ, was having to try to take work by nature of whether or not he had a full beard, a mustache, or was clean shaven. There were like three different parts he was doing at one point, and he was trying to time them in order so that he could actually grow the beard. We were horribly afraid that we were going to have to do a fake beard on Russ. But Marc's beard grows fast, and luckily it worked really well for us. He literally would be filming and saying, "This is good because I can go from here to mustache and from mustache to clean shaven. And if I come back, I can start the beard again." Animals often seem to play an important role as metaphors in the show. Can you talk about how you incorporate them into the story? 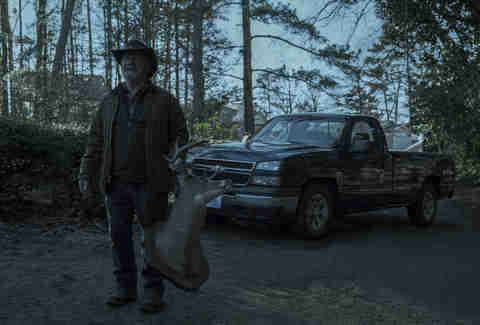 Mundy: The reality of death and Jonah shooting that deer and then feeling like the deer was watching him all the time was one that was really important to us. The difference between talking about it and doing it and actually taking life. We wanted to be able to see him see life leave that deer, you know? That was a big one for us. We actually filmed a scene in the final episode where you saw the bobcats again. Because we sort of think of those two bobcats as Russ and Boyd. We actually filmed it, but we cut it for various reasons -- mostly a narrative momentum thing -- but I would like to see them show up again at some point because they're out there in the world. Those things and the way nature's always sort of encroaching -- we're always talking about that and looking for those things for sure. Are there other animals or animal metaphors people should be on the lookout for for Season 3? 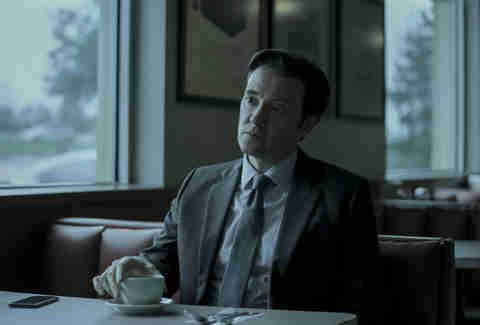 Mundy: [Laughs.] Not at the moment. Sean Fitz-Gerald is an L.A.-based writer who is still waiting for Michael Cera to guest star on Ozark. Find him on Twitter: @srkfitzgerald.